The Scottish craft brewery BrewDog has been busy over the past couple years cranking out delicious West Coast-style IPAs, among other great craft beers, and opening up bars all over the place. BrewDog Shepherd’s Bush is one of these and it’s got a funky industrial vibe with a great selection of local and imported craft beers. Although on the pricey side, the beers at least seem wide ranging and are really interesting, including some all the way from Oregon. In the week leading up to our outing in London, I was tweeting around asking for recommendations on where to eat on a Sunday afternoon. We wanted something casual and a bit different. Texas Joe’s BBQ was recommended and as it claimed to be authentically Texan, and because we love BrewDog beers, we thought it would be the perfect end to a lovely weekend. But in the back of my mind, I was a bit dubious about the authenticity and Texan-ness of the food. There are not many other places in the world that can do American food like Americans, especially barbecue. My friend Jessica of theflyawayamerican.com and I got into a Twitter conversation with Texas Joe himself and he assured us he was from Texas and was producing authentic Texas barbecue through these BrewDog craft beer bars. But he warned that the short ribs I was hankering after weren’t available at the location we were planning on visiting. Maybe I should’ve done a bit more research at the time, but I took his word for it and off to Shepherd’s Bush we went. 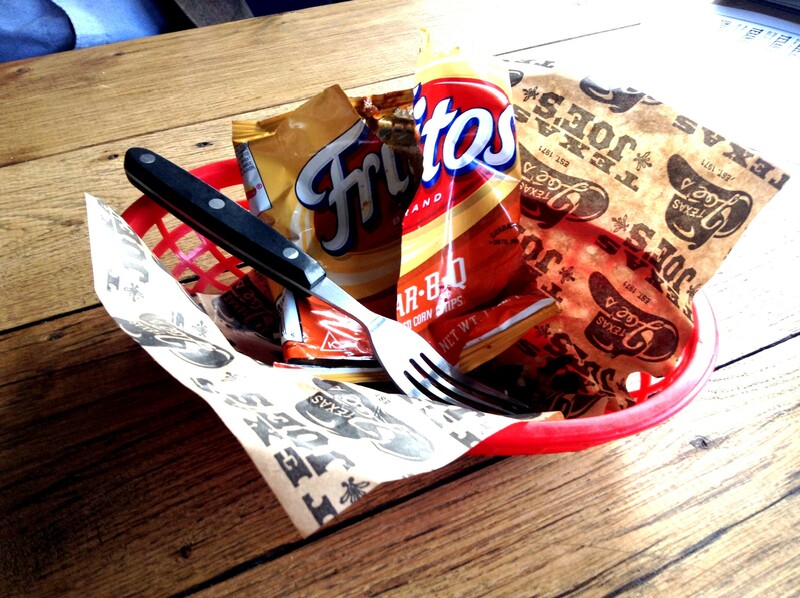 Things started well with the Frito pie. Now, don’t be fooled; this is not a pie, but it is perfect pub grub. Corn chips (Brits read: crisps) covered in chili, cheese, onions and jalapeños. It’s spicy, satisfying and can be made in about five seconds flat as long as you’ve got a pot of chili on the go. To be truly authentic, it should have been covered in orange ‘cheese’ sauce rather than unmelted cheddar, but I’m willing to let that go. The Fritos made it really special, obviously, but it would work with tortilla chips too. As we devoured the Texas pie, we both pondered why more pubs don’t do simple food like this. It’s cheap, it’s easy and it would sell itself after a pint or two. Next was the main event. I had been waiting for proper ribs. Short ribs. I wanted them falling off the bone and packed full of flavor and smoke. We ordered the rib platter (£16) − the word ‘platter’ seeming to imply there might be a few types of ribs to share, but there weren’t. The menu also mentioned a daily rib special, but there wasn’t one. The ribs they had were pork ribs rather than short ribs − and far be it for me to complain about pork of any kind, but they looked and tasted like they had struck up a friendship with a heat lamp. And sadly it seemed the relationship had been going on for some time. The beans were good and the barbecue sauce was good, but they both had the same flavors, hit the same notes and were just a bit same-y. The slaw was tasty and spicy, which I like, but there just wasn’t enough of it − see the ‘plentiful sides’ comment at the beginning of this post. The rub on the ribs tasted good, but the meat was dry to the point of unpleasantness. 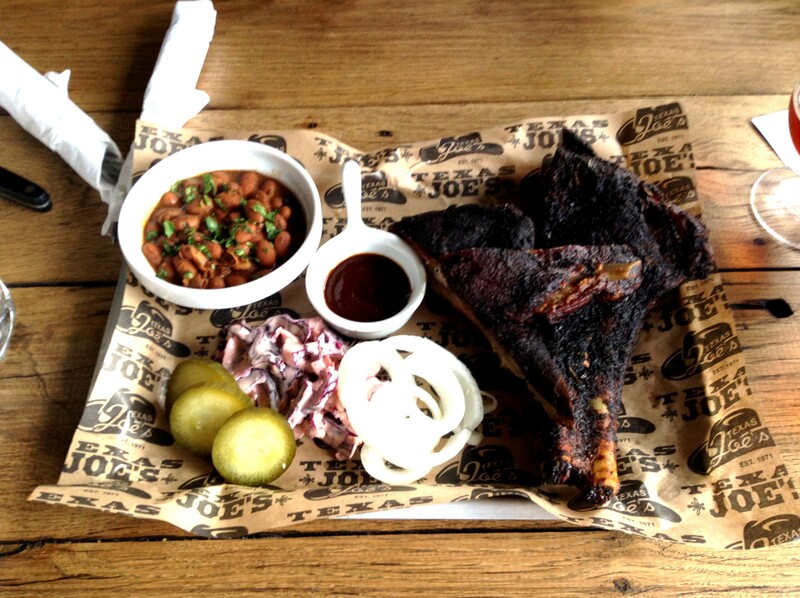 This got us thinking: How do you cater for a place which is a bar that also happens to serve barbecue? Barbecue is something that has to be loved, the flavors and juices have to be coaxed into the meat gently and slowly. You need hours, days even. How can you ensure the meat on offer is always top quality without risking having tons of waste? 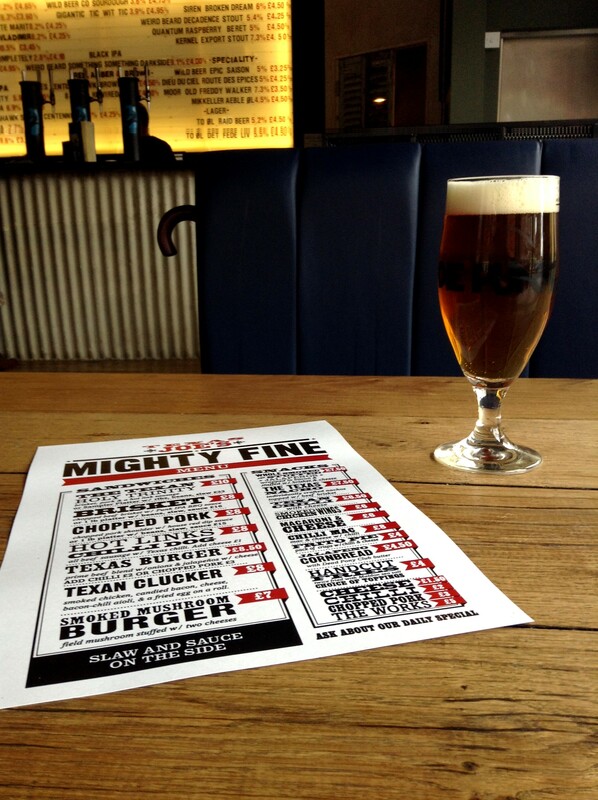 There may be days when you hardly have any customers coming in for a beer, let alone anyone ordering barbecue. I would like to think that the ribs hadn’t been cooked three days before and weren’t sat under a heat lamp since 12 o’clock waiting for someone to order them, but unfortunately what we were served makes that seem like a possibility1. 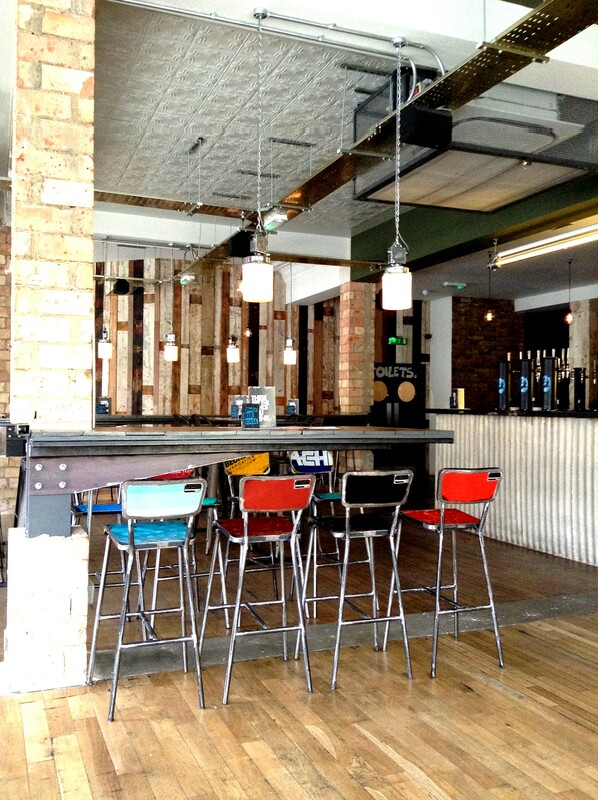 Looking back now, the Shoreditch location was supposed to be where BrewDog launched their Texas Joe partnership, but for some reason there was only a temporary menu2 available. This temporary menu wasn’t mentioned on the Texas Joe website and there was no information at all about the Shepherd’s Bush location on the website either3. 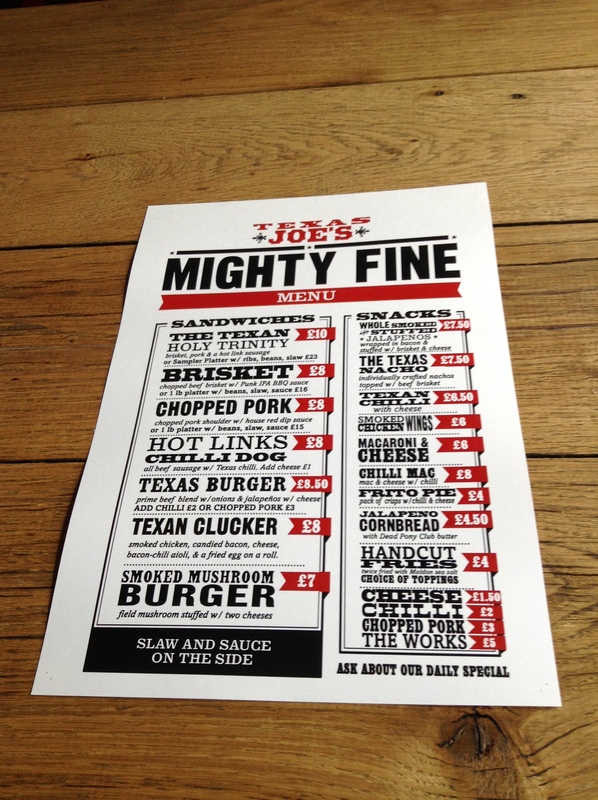 The menu that’s on the Texas Joe’s website, which is supposed to be for Shoreditch anyway but obviously isn’t because this temporary menu is in place, differs to the menu we had at Shepherd’s Bush in both price and offerings. So unfortunately, the whole situation has left us feeling disappointed and a bit confused as to what’s happening where. I think there needs to be a bit more communication through both websites to tell people what they can get and where they can get it. @acrusteaten @flyawayamerican @rhysdgriffiths for me it is a mission. To spread the word and do it proper indeed. In the meantime, go in for a West Coast-style beer and a Frito pie. You’ll be glad you did. 1Since posting this, I have been assured that the ribs are smoked fresh daily and the issue is being addressed with the chef. 2Since posting this, I’ve been informed that the temporary menu was due to the Shoreditch dining room being remodelled. 3Since posting this, I’ve been informed that both the BrewDog and Texas Joe websites are currently in the process of being updated. Great job Pami. They can’t all be stellar reviews, and this will help them do a better job. I am not turned off in the least, and hope to visit myself and see if maybe they just had an off day. I hope it doesn’t put anyone off because I think they could do better. You never know, they might start to breed a passion for true Texas BBQ in these here parts! As a born and raised Texan my commitment to BBQ is deep. Our brisket is consistently voted the best in London and we were just named one of the top three pulled pork joints in town by the Evening Standard. We also search far and wide to source the most authentic ingredients from mesquite shipped from Texas, to oregano from Mexico, to the Fritos in your Frito Pie. Perhaps this was an off day.. But it sounds like you enjoyed quite a lot of what you had. In the words of Minnie Pearl “y’all come back now ya hear?” And we will prove that we are the real deal or I’ll eat my hat. I look forward to the next time then! Who would have thought? 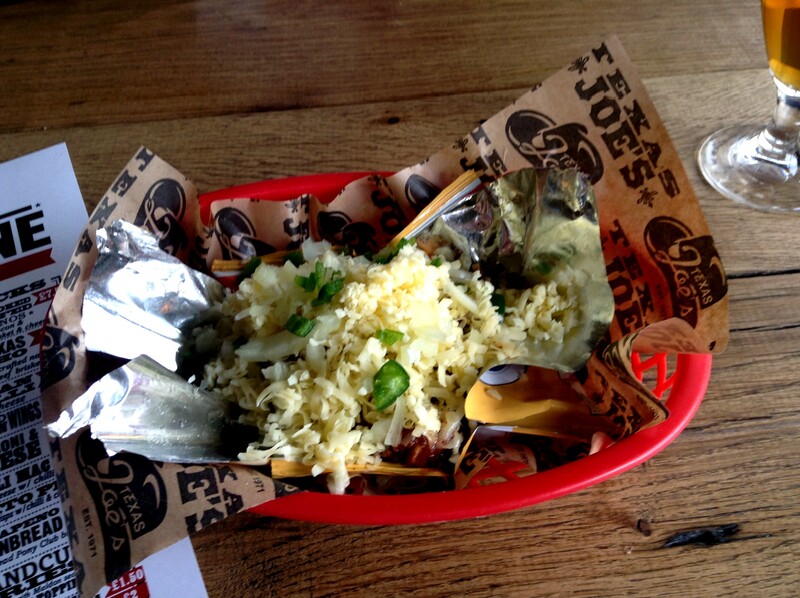 Frito pie in the UK?? Locals in Santa Fe claim that it was invented here. I’m not sure of the reliability of that claim, and I certainly don’t want to get into debates, but it is one of my favorite comfort foods. I’m sure the BBQ will improve with time. It is one of those cuisines that is difficult to transplant. Most Texans will agree on that. Thanks for the interesting post. Is your Frito pie served with orange cheese sauce? I never had it with nacho cheese down south.. it was always just grated cheese on top of chilli. This is actually a pretty good book.. the Frito pie was invented in Dallas. Oh, interesting. I’m sure it tastes much better with actual cheese anyway. No – grated Cheddar – but world-famous Chico’s Tacos in El Paso, Texas serves their “tacos” with tomato-soup like salsa and fluorescent orange cheese sauce. Guess I was definitely wrong about the orange cheese sauce then. Consider me rebuked, Joe! A whole book about it! That’s fantastic.